Puget Sound Energy has had two previous wind farms built for it, but the Pacific Northwest utility recently developed the 149 MW Lower Snake River project, the largest wind farm in Washington, on its own. 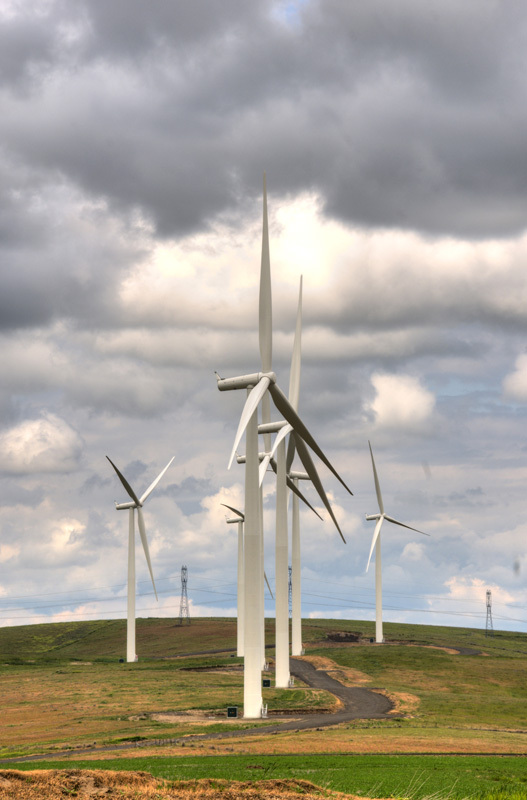 The Lower Snake River wind power project started as a joint venture between Renewable Energy Systems Americas Inc. (RES) and Puget Sound Energy (PSE). When the economy took a nosedive in 2008, RES decided to step back from co-ownership of the project. PSE bought out RES' share and, for the first time, set about developing a large wind farm—in this case, the largest wind farm in the State of Washington—on its own.The new facility's 149 2.3 MW wind turbines sit in southeast Washington, in the farmlands of Garfield County, and generate enough electricity to power approximately 100,000 homes. 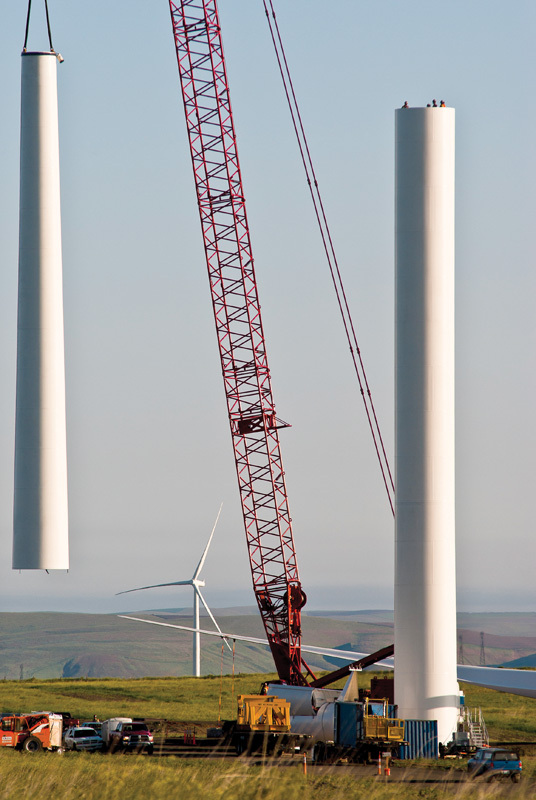 The 343 MW Lower Snake River project is PSE's third wind farm. The utility's 157 MW Hopkins Ridge wind project, built in 2005, is in Columbia County, while the 273 MW Wild Horse wind and solar facility, built in 2006 and expanded in 2009, is in Kittitas County. Together, the three sites generate enough electricity, on average, to meet the total power requirements of approximately 230,000 households. Roger Garratt, director, resource acquisition and emerging technologies at Puget Sound Energy, says PSE had worked with RES on Hopkins Ridge and Wild Horse and began talking to them about the Lower Snake River project in 2007. "In late 2008, we entered into a joint development agreement with them, and at that point, it was a 50/50 partnership," explains Garratt. With the economic crisis, PSE bought them out and owned 100 percent of the development. Prior to stepping aside, RES had done much of the initial development work, such as getting land leases together and working with the Bonneville Power Administration on interconnection. PSE took over from there. Luckily PSE had been involved in the other wind projects, so they knew what was required. project. It's approximately 120,000 acres and spans across two different counties. It entailed doing a full environmental impact statement, among other things. It was a pretty extensive effort. "But a lot of this is the kind of thing a utility does every day when it's building a new substation or building a new power line," adds Garratt. "I think the difference when you're doing a wind project is simply organizing the people that are working on it into a cohesive project team so that they're really executing efficiently and in the simplest way." On this particular project, the community had already seen the construction of similar projects, and a good relationship had been established. The landowners were also quite supportive. "They ended up being a natural constituency and supported the project." One of the major challenges with the Lower Snake River project turned out to be strong winds, with the loss of about 70 construction days. But the construction crews really came together well, so PGE and RES were able to finish the project about six weeks ahead of schedule. Construction started in May 2010, and the clock was ticking. The U.S. Treasury Grant was the big driver to quick completion. Under the law, companies were required to start construction by the end of 2010 (subsequently extended to the end of 2011), which meant getting the project underway as soon as possible. The U.S. Treasury defines "start of construction" as spending five percent of the project's cost in that time period, which Garratt says is harder than it sounds for a wind project. "You can't meet it by simply paying the turbine supplier a five percent down payment. You have to actually show real work that's been done. If you paid a turbine supplier five percent, and they could say, ‘here are the parts for PSE,' that would count, but if you simply have given them a deposit for five percent, and they don't have anything to point at, you don't actually meet the requirement," says Garratt. "From May to December, we decided to meet the requirement by building enough roads at the site and foundations to put a value on the infrastructure over this five percent threshold." The turbine selected for this project was a Siemens 2.3 megawatt unit. Other turbines were considered and evaluated, but the large turbine supplied the best economics. Garratt has been involved with wind projects for a number of years and has seen the technology evolve, not only in size, but in overall sophistication in terms of the way the suppliers approach the business. "When we visited Siemens in Denmark and Germany, they were in the process of converting to what you can almost call an assembly line process of making wind turbines. Whereas going back to the days of Hopkins Ridge (2005), the factory was a situation where they built the wind turbine in a particular location and brought the parts to that particular location," explains Garratt. "Today they have stations, and the turbines actually sit on what look like oversized railcars, which move from one station to the next in this group of defined activities. By doing that, they've made incredible progress in terms of how quickly they can be assembled." Although RES decided against being a co-owner in the facility, the company was hired to construct the wind farm and hired many of the sub-contractors. As with other projects like this, a number of people were hired from the adjoining counties during construction, and 25 permanent employees were hired on at the facility, including Siemens' technicians who are handling the maintenance. When construction was underway, more than 1,100 oversized truckloads of turbine components were brought to the project site after arriving by ship at the Port of Vancouver, Washington, or by train at the Port of Pasco following rail transport from the Midwest. One of the biggest obstacles turned out to be the wind. Winds were so strong in Garfield County that assembly had to be shut down, and crews lost approximately 70 construction days. At times, trucks were stranded at the site because it was too windy to offload, and drivers had to be shuttled by pilot vehicles to a motel for the night. "There was quite a bit of frustration for a while," explains Garratt. "Fortunately, the crews really came together well and were extremely accommodating so, at the end, we actually finished the project about six weeks ahead of schedule." They could accomplish this feat, in part, because many employees were veterans when it came to projects like this. Also, PSE's project manager, Brian Doughty, was also incredibly experienced—having built projects all around the world before coming to PSE. Lower Snake River went into commercial operation in late February 2012. The facility's development and construction, including transmission-network upgrades for connection to the regional power grid, cost $830 million. To date the wind farm is producing more power than forecasted—even without the dramatic winds that shut down construction. That doesn't mean it will pay itself off faster though. Because PSE is a regulated utility, all capital investments are set by the Washington Utilities and Transportation Commission. It will probably take 10 to 12 years for PSE's project to pay for itself. "Unlike an independent developer who would look at a payback or look at a rate of return, we pay attention to the levelized cost of electricity coming out of this facility and how that compares with other alternatives that are available to us, because we have to always look at things from a least-cost perspective," says Garratt. In May, PSE held a celebration in the town of Pomeroy to thank the community and celebrate the completion. It was a good time with food and a bus tour of the wind facility. "Watching a vision become reality was one of the big highlights for me, especially considering the size of the project," says Garratt. "It was substantially bigger than anything else we've done before and also big in terms of using larger turbines. It was also satisfying to see the local community being excited and supportive." Super supportive might be the better term. During most of the construction phase, the Pomeroy Chamber of Commerce and the city put up a billboard for everyone to see as they came into town. It showed a wind turbine with a farmer's combine underneath, and it welcomed wind power to Garfield County. "I would say in all my years of developing projects, I never had anyone buy a billboard to welcome us into town," says Garratt.